Last week I made the case for "Extenders over Computers" and definitely touched a nerve with the HTPC community. Today I'll make the case for the other side of the argument: The case for computers (HTPC's to be exact) over extenders. Home Theater PCs are by design (and by name) Personal Computers and there are still many good reasons to use a computer by your TV instead of an extender I'll explain why today. What? All HTPC's are computers right? I thought I should point out that this discussion is to debate the pros and cons of the computer at the TV, NOT the computer HTPC in general. All HTPC software programs require at least one computer to run the software, store the media on its hard drives and drive the TV tuners etc. We're talking about the case where you have one computer serving the media. 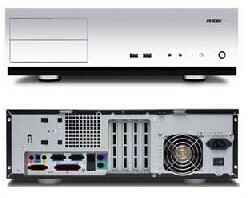 This server, HTPC computer may be in your study, basement or a closet and "serving" your HTPC or extender in the living room. It is this Media Center device at the TV being debated here. Why Use a Computer HTPC at the TV? While I've become a major proponent of using a extender for your Media Center "gateway to the TV", I do still have a HTPC that I use nearly every day. And I also agree that there are many reasons a computer HTPC still makes sense for the DIY HTPC user. Flexibility of HTPC platform - Extenders lock you in to a specific HTPC software so if you buy a SageTV HD200, it only works with SageTV; want a Linksys Extender? - you're locked in to Media Center. This gets to be an even bigger issue if the HTPC software stops supporting a given "generation" of extenders - just ask those who purchased the generation-1 extenders that didn't work with VMC. Upgradable - Want to update your setup with the latest hardware such as video card, memory, optical drive (DVD, Blu-Ray or whatever), even the CPU? You can do that with a computer, but would have to purchase the newer version of the extender. More Features - web browsing, e-mail etc is typically not possible on an extender. Depending on the HTPC software you're driving your setup with, some plugins might not work - for example the Netflix & Online Radio Plugins for SageTV don't work on the HD Theater. With Media Center, the file types the extenders can handle are more limited with the extenders versus the PC. With an extender, updates to your device are dependant on the company who makes it. Keyboard - Using a computer means you can pull out that wireless keyboard on occasion to enter a long search string or enter other information that is a bit unwieldy with a remote control even with the best of user interfaces. You can't use a keyboard with most if not all extenders. Speaking of keyboards, I'll have three different ones reviewed next week with my favorite of the bunch going to one lucky GeekTonic reader! Online Video - Want to pull up that Netflix online video or Hulu TV show onto your TV? Right now, your best bet it via the web browser on your computer. Hulu is coming to SageTV extenders, but for now the computer is the way to do it. Blu-Ray - Yes, you can rip Blu-ray discs to your hard drive and with some extenders (SageTV HD Theater I'm talking about you) you can view those Blu-ray rips, but the process is time consuming and takes up hard drive space on the server. If you have a HTPC computer at your TV, you can also have the optical drive of your choice (these days that would be a Blu-ray player) and watch that media right from your HTPC box. Those are the big points on the pro-computer side of the argument. The computer does give you the most flexibility, feature-set capability and upgradability you can get with your HTPC setup. The question for you is this: Are these enough to sway you towards just using a computer at the TV as opposed to a small, silent, plug-n-play extender? I think the answer all depends on you and whether you are willing to deal with the trade-off's either way. I personally have both a computer and extender in different places in my home, but If I had to choose between the two I would go with the extender and give up those advantages mentioned above. The comments last week were great on both sides of the aisle. I'm looking to hear from you on these points for pro-HTPC computer. Did I miss any advantages either way? Any advantages/disadvantages particular to Media Center or GBPVR users?